When was the Aeneid written? Virgil was still working on revising the Aeneid when he died in 19 BC. The poem contains a few lines which are only half as long as they should be, which confirms the traditional belief that the work is unfinished. The poem is not, however, incomplete; it was meant to end where it ends. The tradition also says that Virgil was so dissatisfied with the Aeneid that on his death bed he gave orders for the manuscript to be burned, but the executors of his estate did not comply. In what period does the story take place? Aeneas is a character in Homer's Iliad. 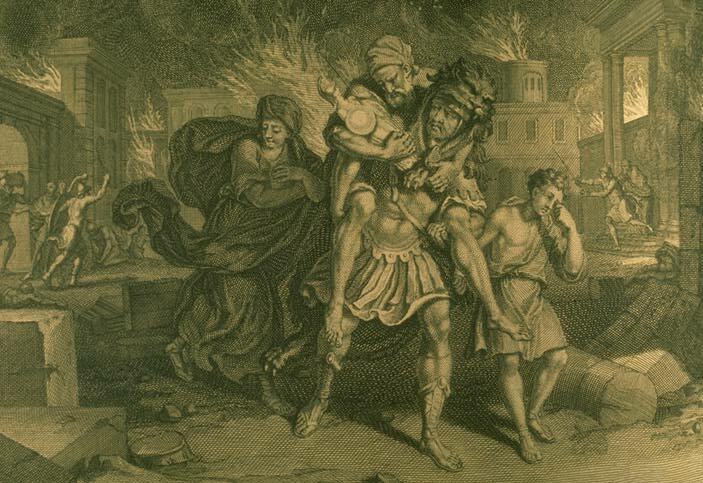 The story of the Aeneid is set in the years immediately after the fall of Troy. One ancient chronographer figured that Troy had fallen in the year 1184 BC, and archaeological evidence at the site of Troy confirms that there was a violent destruction in the second half of the 12th century BC. Is the Aeneid historically accurate? Yes and no. The Aeneid is primarily a work of fiction. No Trojans or Greeks settled in Latium (the region of Italy where Rome is) in the 12th century BC. The first signs of advanced civilization in the region and on the site of Rome are much later. The Romans were not originally ethnic Greeks or Trojans, they were a blend of Etruscans (whose ethnic identity and place of origin are disputed) and local Italic peoples (an element which the Romans acknowledged). However, the Aeneid contains allusions and references to people and events from the centuries immediately prior to its composition, and these are historical. Did the Romans believe the Aeneid was historically accurate? This is hard to answer because the evidence is limited. Based upon what the Roman historians had to say about the earliest beginnings of Rome, it seems likely that a Roman would have seen the Aeneid as a fictionalized account of events which in their broad outline were historically accurate. What about the meter and performance of the Aeneid? The Aeneid is written in dactylic hexameters, the same meter as the Iliad and the Odyssey. The meter is based upon a combination of long and short syllables. Unlike those poems, the Aeneid was written to be read rather than recited or sung to an audience. But most people in antiquity read out loud even when they were alone. And performances of selected parts of the Aeneid certainly did take place. What else did Virgil write besides the Aeneid? Virgil left behind two other major works, the Eclogues and the Georgics. The Eclogues are ten short poems in dactylic hexameter. They belong to the genre of pastoral poetry: the poems are imagined as being composed or performed by herdsmen and other rustic characters, and they are much concerned with the natural world of plants, trees, flocks and so on. However, the Eclogues also have political themes. The Georgics is a longer poem, four books of dactylic hexameters in the genre of didactic (instructional) verse, as practised by Hesiod in the Works and Days. The Georgics purports to be a book of advice for farmers; but it too has major mythological and political components. Was Virgil a court poet for Augustus? No. There was more distance between Virgil and Augustus than that term would suggest. However, Virgil did enjoy the patronage of Maecenas (a close associate of Augustus) and may have depended upon it for his livelihood. The extent to which the Aeneid promotes or subverts the political program of Augustus is debated. The Aeneid is an intensely Roman poem. A Roman poet was most himself, most Roman, precisely when he was imitating a Greek poet, as if he were then most aware of his own individuality. Virgil did not 'start' with Homer but with his own Augustan 'symbol-complex' and his own subjective style. He did not so much 'copy' Homer as fit Homeric motifs into a radically un-Homeric scheme that he had elaborated without reference to either Homer or the epic genre or indeed any sort of narrative plot or story. Homer really came last in the genesis of the Aeneid: he was as it were the necessary model ... but he was a model only in the sense that he was made to fit a pre-existent structure. What he did to Virgil -- how Virgil's central design, in other words, was affected by Homeric motifs -- is the important question. Homer contributed nothing to the design itself. It is here, finally, that we reach the true explanation of Virgil's 'success' in epic. He could write a great 'Homeric' epic; he could ... assimilate an outmoded form and content to a contemporary subject; he could thus Augustanize Homer and revive heroic myth in truly successful poetry, because he consistently adapted Homer to a thoroughly un-Homeric ideology, always converting the objective narrative of Iliad and Odyssey to one that was both subjective and symbolic. In a sophisticated and self-conscious literature, such as Roman poetry and its immediate Hellenistic predecessor, tradition and imitation always stand in a dialectical relation to one another .... The self-conscious use of literary models also straddles the dialectical relation between a literary work's reflection of cultural contents and its deliberate recasting of those contents into a new form, a form "estranged" (to use the Russian Formalist term) from the familiar, everyday discourse of the culture. Literary allusion in particular partakes of this dialectical relation. On the one hand it assimilates present experience to past tradition and therefore provides a larger frame for validating the literary work as a representation of "reality" and as an embodiment of cultural norms. On the other hand allusion calls attention to the autonomy of the literary system, to the art world created as something apart from the "real" or the experiential world, as something with a logic, structure, and coherence of its own. By its very nature allusion calls attention to the fictive frame as a fiction, and thereby also calls attention to the art and artifice of literary representation. Perseus' Aeneid. Available in English or Latin. This site offers a very useful set of tools for studying and teaching the Aeneid. Includes plot summaries, character sketches, study questions, term paper topics, and short selections of scholarly opinions and bibliography. The site is designed to be accessible to high school students, but there is material there useful for more advanced students as well. The best single set of links to Virgil resources on the Internet. The author of the page has done innovative work with classes on the Internet and collaborative research projects, mainly on Virgil. You can explore these from this page. A fourth century AD biography of Virgil by a scholar who also wrote commentaries on his poems. Do not assume that everything Donatus says is true. A few of the many thousands of works on Virgil and the Aeneid. These are mainly general books as well as papers concerned specifically with the issue of Virgil's relation to earlier poets. W.S. Anderson "Vergil's Second Iliad" Transactions of the American Philological Association 88 (1957) 17-30. "On Vergil's Use of the Odyssey" Vergilius 9 (1963) 1-7. C. R Beye, Ancient Epic Poetry: Homer, Apollonius, Virgil Ithaca, 1993. W. Clausen, Virgil's Aeneid & the Tradition of Hellenistic Poetry Berkeley, 1987. "An Interpretation of the Aeneid = pages 75-88 in Virgil: A Collection of Critical Essays, ed. S. Commager, Englewood Cliffs NJ, 1966. G.B. Conte (tr. C. Segal et al.) The Rhetoric of Imitation: Genre & Poetic Memory in Virgil and Other Latin Poets Ithaca, 1986. K.W. Gransden Virgil's Iliad: An Essay on Epic Narrative Cambridge, 1984. W. R. Johnson, Darkness Visible: a study of Vergil�s Aeneid Berkeley, 1976. F. Klingner "Virgil" = pages 131-155 in L' Influence Grecque sur la Poésie Latine de Catulle à Ovide [Entretiens Hardt vol. II, 1953]. G. Knauer "Vergil's Aeneid and Homer" Greek, Roman, and Byzantine Studies 5 (1964) 61-84. G. Lee "Imitation and the Poetry of Virgil" = pages 1-13 in Virgil, ed. I. McAuslan & P. Walcot, Oxford, 1990. L.A. MacKay "Achilles as a Model for Aeneas" Transactions of the American Philological Association 88 (1957) 11-16. B. Otis "The Odyssean Aeneid and the Iliadic Aeneid" = pages 89-106 in Virgil: A Collection of Critical Essays, ed. S. Commager, Englewood Cliffs NJ, 1966. B. Pavlock, Eros, Imitation, and the Epic Tradition Ithaca, 1990. V. Pöschl (tr. G. Seligson) The Art of Vergil: Image and Symbol in the Aeneid Ann Arbor, 1962. This page was designed by David Silverman for Hum110 Tech.